December 2014 n Performance & Hotrod Business n 23 adds. "Regionally, we are also seeing some strong interest in spec series dampers to limit cost to the racer while still maintaining high performance and consistency levels." Recovery means new dollars coming into the sport, sometimes in new areas. "The growth of import/FWD class circle track racing is a positive," Gill notes. "Race tracks and series originally mandated stock OEM wheels, but due to safety concerns, are now requiring purpose-built steel rac- ing wheels." Rules regarding the well-being of racers is also a trend to watch, Disterheft believes. "There seems to be a continued focus on safety, whether that be for the driver, pit crew or track workers," he says. "There has been quite a bit of ongoing innovation in this market as well. 2015 also marks the Snell SA2015 helmet certification changeover. Some other positive trends would be that some track owners, race series and sanctioning bodies have made rules changes to try and help contain the cost of being competitive." Competition Cautions With trends come challenges. We asked our sources for the ones they see coming. "The biggest challenge is to maintain a high level of quality and design innova- tion at an affordable price," says Paulsen. "Innovation is a moving target in racing because of the mechanical aspect of motor- sports. It's also the key factor in keeping fans coming to watch racing. Racing series' continue to trend toward over-regulation because of the constant perception of the need to cut costs. Circle track series need to look at the professional level to see the result of over-regulating a popular series. It changes the dynamics of a successful series and, typically, drives the fans away. It's a challenge to keep a series affordable and not alter the dynamics of the racing prod- uct. It's equally challenging to do business in that environment where products must meet a price level and still turn a profit." MacDonald tells how a particular prod- uct relates to trends. "The varying shock rule structures in place among the different sanctioning bodies continue to require many variants of similar shocks. Ultimately, this is not cost-effective for the manufacturer, dealer or racer." Behuniak has more to say about costs. "As with any racing, you want the cost to be as inclusive as possible, while at the same time allowing for innovation and improvements." Stacy continues on that theme. "Costs will always be the biggest chal- lenge for racers going forward. The cost of a lot of the parts have increased faster than most people's pay. As racers look to save a few bucks, they tend to buy products solely on cost. 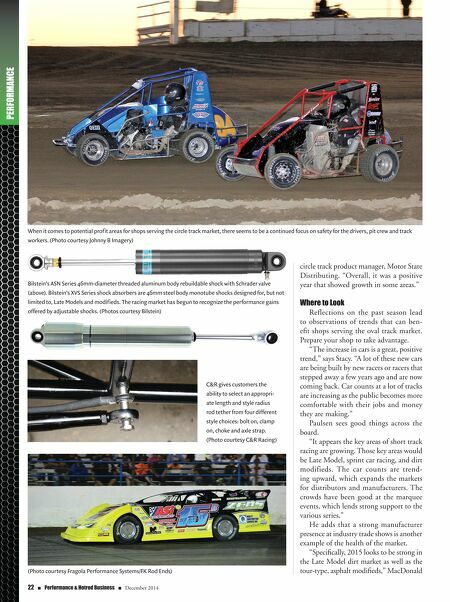 I have had many racers make the comment that FK Rod Ends might be a few The biggest challenge is to maintain a high level of quality and design innovation at an affordable price. 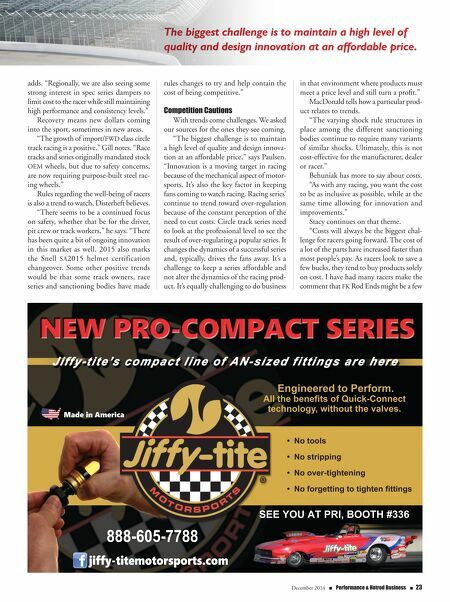 888-605-7788 SEE YOU AT PRI, BOOTH #336 Made in America jiffy-titemotorsports.com • No tools • No stripping • No over-tightening • No forgetting to tighten fittings Engineered to Perform. All the benefits of Quick-Connect technology, without the valves.